Photo Slideshow Director HD provides different options for enjoying and sharing finished photo slideshows. Tap the "Export" icon, you can see a list, showing supporting output options. 7.1.Play a slideshow on HDTV. Touch HDTV/Airplay from output option list, enable the your iPad airplay function(or connect your iPad to HDTV with Apple Digital AV Adapter and HDMI cable) to play the slideshow on your TV. 7.2.Save a slideshow video to Camera Roll. Touch "Photo Library" option from output option list, enter slideshow videos title/description and choose video resolution from 360p, 540p and 720p. Then touch "Publish Now", the app will begin to encode and save the photo slideshow to iPad Photo Library. 7.3. Upload a slideshow video to Facebook and YouTube. Touch Facebook/ YouTube option from output option list,enter slideshow videos title/description and choose video resolution from 360p, 540p and 720p. Then sign in your Facebook/YouTube account to publish the slideshow video. 7.4. 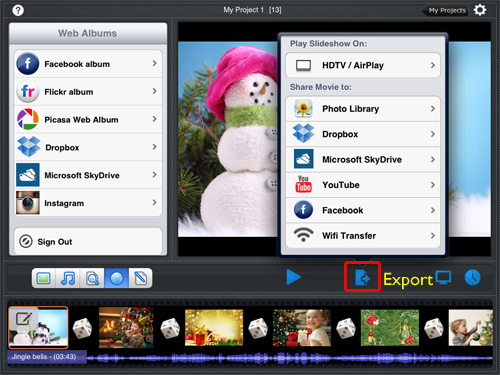 Upload a slideshow video to Dropbox and Skydrive. Touch Droobox/ Microsoft SkyDrive option from output option list,enter slideshow videos title/description and choose video resolution from 360p, 540p and 720p. Then sigh in your Droobox/ Microsoft SkyDrive account to upload the slideshow video. 7.5. Wireless transfer a slideshow video to computer. Touch Wifi Transfer option form output option list, then a Wifi Transfer window will come out, showing you tips to use Wifi Transfer option and a URL address. Enter the URL into your computer browser, the slideshow will be lised on the browser, click it to download it to your computer. To use the Wifi transfer, please make sure your computer and iPad are using the same internet.